Description: Ethereal pale lavender and white blooms display primrose yellow centers to create colorful garden excitement in early spring. 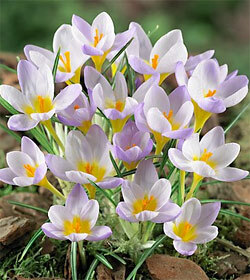 A species crocus, 'Firefly' grows just 6-12” high, making it perfect for edging a path or a perennial border, or for underplanting trees and shrubs. This variety also naturalizes exceptionally well, increasing in numbers year after year. Guarantee your garden success with our plump, premium bulbs – order today!